First Christian Church – SAVED! Constructed in 1901, the First Christian Church is the oldest church building in Santa Anna. Many of the exterior and interior detailing remain such as the clapboard siding, wainscoting, pews, and pulpit. The congregation still uses the church building every Sunday for Bible study, however, church services are held only once a month since the congregation has been without a pastor since 1995. 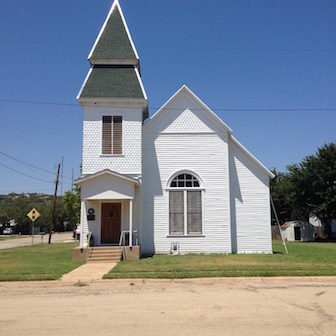 The First Christian Church is a Register Texas Historic Landmark. With an aging and diminishing congregation, the church building has not been maintained. The existing asphalt shingle roof was added in the 1960s and the building has not been painted since the late 1970s. The congregation and its supporters need professional guidance in maintaining and preserving the church for future generations and the community of Santa Anna. UPDATE: The First Christian Church has been restored!